We offer 2 courses at Primary Key Stage 1 & 2: Absolute Beginners & Drum Kit Beginners; plus, we teach ‘1 to 1’ & ‘1 to 2’ classes at both Primary & Secondary schools. Absolute Beginners: a good, general intro to rhythm & drumming in music. 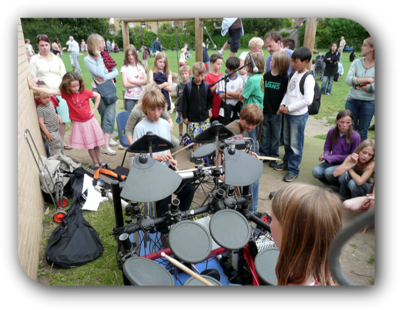 Children will learn about rhythm in modern music, bring in their own CDs, identify key drummers, be introduced to the drum kit and learn their first drum rhythms. Drum Kit Beginners: naturally follows on from the AB course above and focuses more on drum kit rhythms but still incorporates plenty of music listening and covers some basics of music performance & recording. Lessons are in groups, normally 20 or 30 mins. I also run one-off shortcourses at Primary and Secondary schools too, just to give a taster for drumming. You can then jump on to a an AB or DKB course afterwards! If you need details on costs & availability please email or phone using contact details below. After children have taken part in lessons or shortcourses, there may be an opportunity to play at school in front of family and friends.